WHAT DO YOU MEAN BY "CHOOSE"? By "choose" we don't mean that you get to pick the people you work with. And even if you could, it wouldn't mean that the people you work with would magically walk out after a project kickoff meeting and announce: "Ta-dah! Now we're a team." A team is a choice. Every day, every meeting, every deadline, individuals make the choice to be a team. We don't just make the choice once during a presentation or an offsite. We choose and choose, and then we choose again, at each point during the life of a project. YOU KEEP SAYING "YOU." WHO DO YOU THINK WE ARE? WHO IS THIS BOOK FOR? You are on a project team. Your nonprofit is launching a new service. You're with a software company. You're a designer, a programmer, a developer, an engineer, a content strategist, and you also do interaction design, UX/UI, packaging, and finance. You aren't C-suite, but you might be some day. It's your first week. You've just been made the team lead. You're the project manager, the product manager, and the program manager. You're on your first team. You've been here for years. All of you want the same thing: to have a better overall team experience that helps everyone get things done. This book is for you. We're a lot like you. We've been with design teams, collaborating with other disciplines in making products and services. We've each had our own careers, and now we have our own business. The two of us have traveled all over the world and talked with thousands of people about how their teams work. We've lost count of how many teams we've trained. Most of these teams work in what's called innovation or R&D or product development or nonprofit program design. No matter the labels, these teams are thrown big messy problems that need to be solved with an experimental approach. They are multidisciplinary, with people from diverse cultural backgrounds and unique training, skills, and important letters after their names. They are focused on crafting a great customer experience (CX) or user experience (UX) or service experience (SX) or a plethora of other acronyms. Throughout all of our time working with teams, several patterns emerged. Teams wanted more alignment, better decision-making, and of course, a sense of agency and ownership. 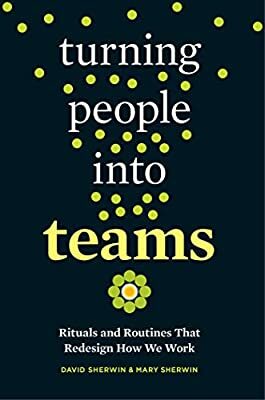 This book is a collection of the best rituals we've given to teams to help with those things. The book reflects our ultimate goal: to build teams that capture the strengths of each individual.